What do you get when you put together the coolest kid in class, an unpredictable live-in grandmother, and a caring but anxious grandson? Disaster? No. You get to know Ruben Plotnick. David is worried about how zany Ruben Plotnick will react when he meets Grandma Rosie, who often says and does unexpected things. Will Ruben make fun of her to their classmates? Will he imitate her whispery voice? What will he do if Grandma Rosie suddenly wants to dance? This heartwarming story of senility and school-age embarrassment reveals the importance of looking beneath the surface to really get to know someone. 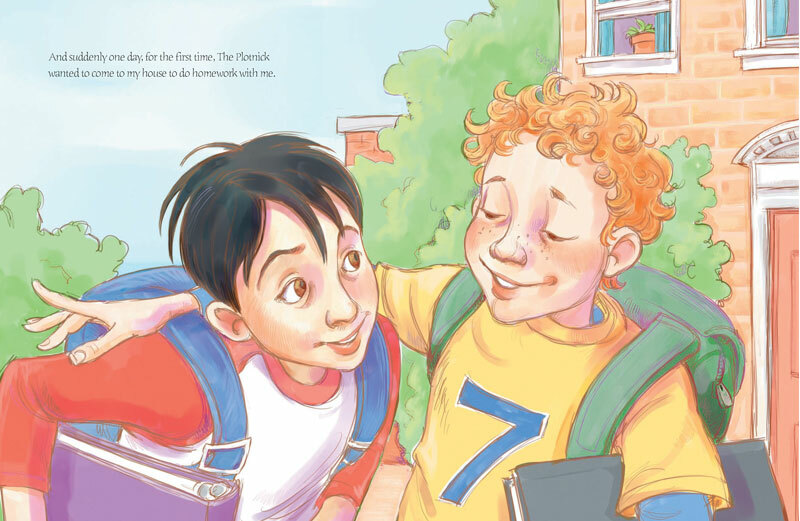 David is thrilled when Ruben Plotnick, “the coolest kid in my class,” asks to come to his house to do homework together. But he is also concerned about what Ruben will think of his Grandma Rosie, who lives with him. She is forgetful, sometimes withdrawn. But she also sings beautifully, bakes great cookies, plays a mean game of checkers, and loves to waltz. Ruben surprises him, first by joining in grandma’s waltz, then by not making fun of him and his grandma in school as he feared he would. Grandma Rosie, the center of most scenes, is envisioned by Manning with digital pencil, watercolor, and chalk as brim-full of vitality. There is an elegance to her hands and a youthful spirit to her gray pony tail. When she waltzes we can feel her joyous memories of her past. The kids are just supporting characters, although “The Plotnick” is quite a cut-up. Readers can learn more about living with the elderly, along with the lesson of not prejudging people, through David’s story. -Kenneth and Sylvia Marantz, authors of eight books on the art of picture books. 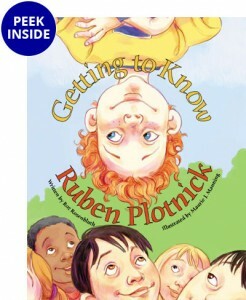 All of us should get to know Roz Rosenbluth’s Getting To Know Ruben Plotnick with illustrations by Maurie Manning. This is a story about real family values, compassion for others and how kids are often smarter than we think. Hats off to “Ruben Plotnick”! Thank you for sending Ruben Plotnick. I enjoyed it very much. The voice of the narrator worked so well for me. …The illustrations of the characters fit comfortably with the words, particularly Grandma Rosie’s wonderful dance poses. Congratulations to Roz Rosenbluth, Maurie Manning, and Flashlight for making it all come together so well. I hope it is enjoyed by many. This is a tender storybook…that manages to touch on popularity, peer pressure and senility without any preaching whatsoever… Every character expands beyond stereotype in a way that will help kids cope with their own concerns about being less than perfect. As we do each week on this day and this hour I suggest some book that would be good for you to read. Either chock full of information or enthralling or as this one is, so touching and great for your kids. This is a kids’ book, written by Roz Rosenbluth and illustrated by Maurie Manning, and it’s called Getting to Know Ruben Plotnick. This is a terrific book. Really, a terrific book. This is a book about David’s grandma who is getting senile with Alzheimer’s. No, it is not a morbid, how-do-you-deal-with-grandma-with-Alzheimer’s kind of book at all. This is the cutest book. A children’s hardcover book for ages 5-9, Getting to Know Ruben Plotnick is about a boy named David whose “Grandma Rosie” has dementia. Sometimes, David’s Grandma forgets his name and talks to her husband who died years ago. When the most popular kid in school—Ruben Plotnick, the title character—comes to David’s house to play, David worries that his Grandma Rosie’s antics will embarrass him, particularly when she is known for waltzing spontaneously. Will Ruben make fun of her behavior and tell the rest of the school? Will David end up embarrassed in front of his playmates? 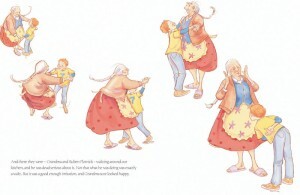 This sensitive and clever story deals with school-age embarrassment and what dementia looks like from a child’s perspective. It teaches young children not to judge a book by its cover and has a few surprises at the end. All 15 pages of this book are well-illustrated by Maurie J. Manning and have colorful drawings of both people and scenes. 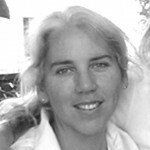 Roz Rosenbluth is best known for her fiction in Cricket and Highlights magazines for children. Getting to know Ruben Plotnick is a wonderful and heartwarming experience. All children will recognize the anticipated embarrassment they experience when their friends first meet their parents or grandparents. The book is funny, touching and insightful — and has much of value to say about family and friendship. The delightful illustrations by Maurice J. Manning bring the story alive, adding to the overall charm. Anyone who loves their aging parents or grandparents should read this book. It’s a heart-warming slice of American life in the new millennium. In a touching and charming story, David is understandably concerned when the coolest kid in his class, Ruuben Plotnick, invites himself over after school. What will Ruben think of David’s Grandma Rosie, who plays a great game of checkers but whose favorite activity is dancing with Grandpa Nate, who died five years ago? To David’s great relief, Ruben Plotnick graciously offers to waltz around the kitchen with Grandma Rosie. This is a compassionate story about dealing with senility in those we love and of blossoming friendship. This is the kind of book that’s going to surprise you at every turn. 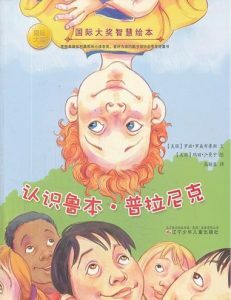 And the surprises are all pleasant.Ruben Plotnick is the most popular boy in the class, the kid everyone calls “The Plotnick.” He’s got red hair, he’s funny, he’s smart, and “Everyone wants to be his friend.” One day, Ruben says he wants to study with David. The only problem: David’s grandmother is forgetful. She’s “very pretty,” David says, and she’s a “great singer, too. …And she still makes the best chocolate cookies I ever tasted.” But she spends much of her day in her rocking chair, and she “talks” to her dead husband, Nate. The worst, though, David says, is when she’s quietly sitting around, then suddenly jumps up and calls, “Nate, let’s waltz!” This is just the kind of scene David fears as he heads to his apartment, Ruben Plotnick at his side.When they arrive, Ruben makes himself right at home. He jumps in the kitchen sink and has some milk and cookies. Grandma is there, speaking in her quiet voice. She tells Ruben hello. David can “just imagine [Ruben] answering questions in class the next day in Grandma’s voice. In fact, I expected him to say hello back to Grandma in a funny whisper.” But instead, Ruben simply greets Grandma in his normal way. “Nate, let’s waltz,” Grandma says as she looks at Ruben. David intervenes. “Okay, let’s waltz,” he answers, hoping to get it over with quickly. But Grandma wants to waltz with Ruben. David is cringing. Ruben jumps down from the sink, puts his arm around Grandma’s waist and dances. When I first read Getting to Know Ruben Plotnick, it waltzed into my heart and touched me in a way in which no other children’s book had before. It’s a heartwarmingly-touching, goose-bumps moment when that kooky kid chooses the high road and dances with David’s forgetful Granny. It continues to be one of my all-time favorites! This Flashlight Press treasure captivates its readers, young and old alike, because of its intergenerational flavor and flow and its sensitivity to a difficult and oft-times heartbreaking subject. Check out this book and I think you’ll agree that Ruben Plotnick is a cool kid that you’ll love getting to know! 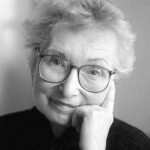 Roz Rosenbluth is the author of Getting To Know Ruben Plotnick, illustrated by Maurie Manning. Roz was a winner of the Highlights Magazine humorous fiction contest in 2000, and her stories have appeared in Highlights and Cricket Magazines. Of her craft, Roz says, “I feel most fulfilled when my stories reflect the culture and values I grew up with in a close community of working-class, politically aware people. My husband, a research scientist, and my three children, have always encouraged my writing and have been my severest critics and biggest fans. Now I am lucky to have six grandchildren to inspire me with their sense of wonder, tears and laughter.” Roz has published twelve picture books, and lives in New Rochelle, New York. Maurie Manning is the illustrator of Getting to Know Ruben Plotnick, written by Roz Rosenbluth. She does much of her art digitally, which allows her to imitate almost any traditional media. Maurie has the amazing ability to draw her warm and friendly characters from very unique perspectives. “Since first grade I’ve known I wanted to write and illustrate children’s books. …I spent much of my childhood in the self-imposed study of anatomy. I had the ridiculous idea that Norman Rockwell “drew from his head,” and my goal was to draw people as well as he did! So I poured over anatomy textbooks, drawing bones and muscle groups for hours at a time. I have to admit my extreme disappointment in finding out that Rockwell used a projector and traced photographs onto his canvas. …much thanks to my mother whose constant critique that my work was “too stiff” helped me move out of simple representational drawing and into a unique personal style.” Maurie has illustrated many kids’ books including How Full Is Your Bucket for Kids. Her past and present art clients include: Children’s Digest, Child Life, Humpty Dumpty’s, Highlights for Children, Sony Interactive, Josten’s Learning, Computer Curriculum Corporation, Strategic Simulations Inc., Lucent Books, Steck-Vaughn, Pearson, Hampton Brown, Child Welfare League of America, Girl Scouts of America, and Boyds Mills Press. Maurie lives in Stockton, California. You can see more of Maurie’s work on her personal website. Error: Error validating access token: Session has expired on Sunday, 23-Sep-18 01:36:16 PDT. The current time is Friday, 26-Apr-19 01:03:10 PDT.